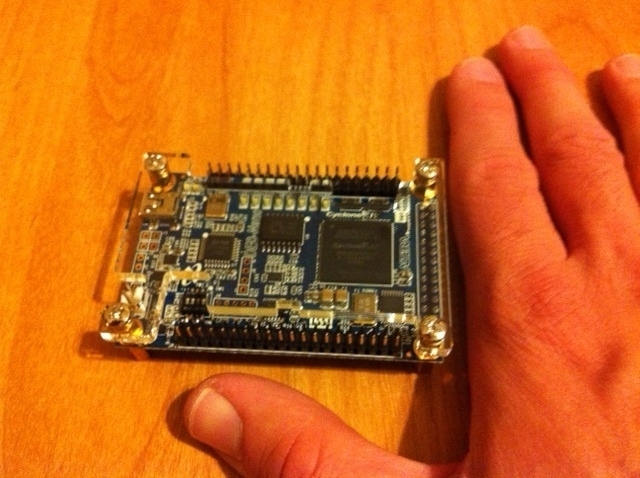 The DE0-Nano development board from Terasic. This little guy is exactly what I was aiming for with my Saturn Project. Looking at everything they pack in here for $79, I don’t think there was anyway I could have competed. 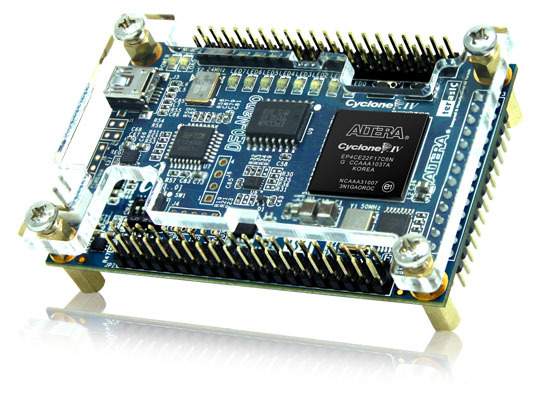 I’m getting the feeling FPGA development in the hobby-space is still pretty limited, especially with the Cyclone II Breakout board being discontinued. If you want to pick up one of these for yourself you have a few different options. From what I’ve read on various forums it’s really difficult (and actually more expensive in the end) to order directly from Terasic and ship to the US. Apparently, you have to pay with a money order and the shipping options are pretty limited out of Taiwan. Another option is to cruise on over to Adafruit, they are selling it for $99. Finally, probably the best option is to pick this up from Digikey for $86.25, you’ll want to compare the shipping options and prices to find what’s best for you. Using the board is super easy, in the first hour or two of getting the board I was able to run through both of the tutorials in the manual. The first project is a simple blinking LED project, and the second is dropping in a NIOS II softcore processor using the SOPC Builder tool. The SOPC Builder tool is actually being replaced by the newer better Qsys tool. I’m going to start playing around with Qsys and see if I can make a comparable tutorial. Looking forward to playing around with this little toy and blogging my progress. Did you pick one up? Working on any fun projects with it? Leave a comment and let me know. Great info on the De0-Nano! I just got one myself and made it through to the “Hello World” program running on the NiosII. I was wondering if you had any luck flashing it to memory using the “Flash programmer”? I am having a heck of a time with it. So nice to hear of others using this neat board. Hi Jordan, thanks for the positive feedback! At one point I came across an App note from Terasic stating that they switched (upgraded the size) of the Flash device. I don’t know if I have an old or new version of the board, but the link above worked for me. If you still have problems, you might have the alternate flash device. Let me know if you still have problems and I can try to track down the app note again. I bought one of there from Adafruit. From your post I gather you were able to run the tutorial which included the Nios II processor. I’ve tried to do the same and can compile the design but can’t get past the step where it says “Open the Nios II IDE”. Near as I can tell, this vital piece of software is nowhere to be found in the CD’s sent by Adafruit. For the record, where did you find the Nios II IDE to run the tutorial? Yes, I was able to get both demos in the user manual working, but it’s been a little while. You will find the Nios software inside the Altera program files menu in the start menu.